There are a million wrong ways to measure the return on your content marketing program, and only a few right ways. Unfortunately, vanity metrics still dominate the field, and they’re perpetuated by a lack of understanding of what value truly means in digital marketing. 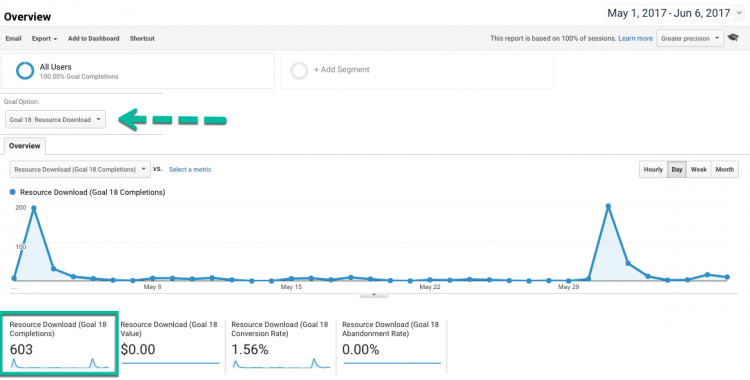 Brafton has dropped 10 percent of its organic traffic over the past quarter, year over year. We also have an increased bounce rate and lower time on site. These red numbers are really bad, right? I should be fired, right? What if I told you that we have increased our inbound leads by 150 percent over the same time period, year over year? And what if I also told you that we killed off some of our high-volume but informational-intent keywords in favor of lower-volume, transactional-intent keywords? But that doesn’t make sense. How could all those red numbers mean you are doing better? Still don’t believe me? What if we flipped all those numbers on their head, and we were looking at solid green arrows pointing up and to the right? That would be pretty satisfying, wouldn’t it? Here’s the problem: What if your pages per session increased 40 percent, but behind the scenes these visitors are having an agonizing experience trying to navigate your site? That simply means visitors are struggling through many more pages than they were before, metrics be damned. The numbers would all be up, but this is not reflective of a quality user experience. That’s why these metrics are indicators, not return on investment. When reported as ROI, we call them vanity metrics. Bounce rate, organic traffic, time on site, pages per session: These are all indicators and not true ROI. There is no revenue stream generated by a good bounce rate (or any other basic metric). We are going to put these on the shelf for the time being while we dig into some true ROI. You have to forget everything you think you know about digital marketing and start with a very basic question: “Why does my website exist?” If you can’t answer this question, you will never be able to measure ROI, because you don’t know what it means for your business. Though ROI takes many forms for different websites (lead generation, e-commerce, subscriptions, etc. ), it should always be rooted in one or two simple metrics that have a direct tie to revenue. Your site exists as an asset to generate money, period. So we need to treat our web properties similarly to how we would treat any other business asset and hold them to the same standards of efficiency and performance. Keeping the underlying goal tied directly to commercial actions will help keep your focus, and we are going to track these commercial actions with two types of goals. Visitor placing a call to speak with a sales representative. These are the goals that are most closely tied to revenue creation for your business. Influence measured by inbound links and overall sharing of content. I recommend taking five minutes and writing out the macro and micro goals that currently exist on your site before moving forward. More often than not, clients misunderstand the purpose of blogs. Their expectations can range from (most often) lead generation on the far end of the conversion funnel to organic traffic growth on the vanity side of the spectrum. As discussed earlier, lead generation is a great macro goal to have for you content marketing strategy. Unfortunately, it is completely misaligned with the type of visitor blogs generate. On the other end of the spectrum, organic traffic growth doesn’t mean anything without context of the bigger picture (macro goals). How do we reconcile this? Blogs exist in the tippy top of the funnel, so it’s unrealistic to expect content that is driving informational-intent traffic to generate transactional-intent types of results. In order to understand what it will do, we need to consider what happens to websites that do not have a blog (static sites). For every page that exists on a website, there are a certain number of queries that will generate that page in search engine results. Imagine you have 100 pages, and each page has 10queries associated that will generate a search result. With some simple arithmetic, we see that the total search presence for this website is 1,000 queries that will generate the site in search results. This is a fixed number of queries that will generate this site in search results. It has maxed out at 1,000. Existing landing pages will not magically start ranking for new keywords, nor should you try to make them rank for more keywords. By adding a blog to your site, you will continue adding pages that will rank for relevant search terms that your existing 100 pages cannot rank for. Thus, you have an opportunity to open up your range of search presence to many more topics than you did previously. Variant terms relevant to your expertise, industry and products await you. In the same example, if you were to conservatively write two blogs per month, with each blog ranking for 10 search queries, you would effectively double your total search presence. This example is wildly oversimplified, but the concept is accurate. So what are we looking for, bottom line? Search presence – the number of queries and frequency at which your site shows up in search results. Micro conversions – newsletter subscriptions, eBook downloads. Email presence – content to nurture your database. Share of mind – you want to be the first thing a visitor thinks of when they are ready to move down the funnel. So how do we go about measuring our search presence, and how does that task relate to return on investment? Impression: The number of times a page on your site has shown up in search results over a given period of time. Clicks: The number of times a page on your site was clicked after it showed up in search results. Click-through rate: The number of times your result was clicked divided by the number of times it showed up in search results. Average position: The average position for which the page or query shows up in search results. Over the past month, Brafton has shown up in search results 1.01 million times, and generated 15.7k clicks. Therefore we can say our search presence in Google is 1.01 million impressions with 15.7k clicks per month. This is our baseline. Doing some quick arithmetic we observe the blog generates 27.7 percent of our entire search presence on Google, along with 47.8 percent of all clicks. Think about that for a second. Our blog generates 47.8 percent of all the traffic from Google search. Had we never created a blog, our search presence would be 27.7 percent smaller and generate 47.8 percent less traffic from search. That’s a lot of search ownership we can’t afford to give up. And with that search presence, we would lose authority for all the variant keywords that the blogs rank for. So what does a company stand to gain from adding a blog? In short, ownership of keywords that your core landing pages will never rank for. A blog lends you the opportunity to take market share for where you otherwise would never have the opportunity, short of writing out hundreds of landing pages, which would make no sense. In a large sense, owning more SERP real estate essentially means stealing traffic from your keyword competitors. Remember, page one SERP formats change often, with Featured Snippets, YouTube videos, Direct Answers and more now crowding out most results below the fold. And because 60% of all clicks go to the top three results in search, owning a commercial-intent keyword in that coveted top three (or even position 0, aka a Featured Snippet) directly correlates to higher click-throughs and effectively pushing your competitors out of searchers’ visibility. Gaining search presence is crucial, but what do you do with all that top-of-funnel traffic? The key is to fully appreciate the mindset of a top-of-funnel visitor and adjust your expectations accordingly. Blog visitors are not likely to make a transaction or submit contact information. More likely, they are information-seekers, not legitimate buyers, casually reading. This is going to result in an 80 percent bounce rate on average. This is okay, and to be expected. This is why it is crucial to funnel as many visitors into the top of the funnel as possible, as it’s likely 99 percent of them have no buyer intent. Not yet, at least. At this point you need to assume these visitors know nothing about you and are going to forget you the second they leave your site. Don’t let this happen. Generating conversions from blog traffic, even if those visitors aren’t in the market for a hard purchase, is made possible by offering them other marketing assets and weaving different forms of content into strategic campaigns. eBooks and newsletters are great ways to match content to your audience and better set content goals once top-of-funnel visitors are familiar with your site. Fully appreciating the fleeting mindset of this audience, you are going to need to give things in exchange for getting very little. For example, you will need to give an eBook, chock-full of valuable information, for free. Seem lopsided? It’s not. If you are able to entice your visitors into downloading your eBook and capture their contact information, you will have an opportunity to nurture them through email. Put them into a small one-month drip campaign that automatically sends valuable content relevant to the eBook they downloaded every few days. Again, you are giving, giving, giving in exchange for mindshare. The more you give, and the more they consume, the more likely your prospect is going to think of your brand when they are ready to buy. This could be in two weeks or two years. You can’t control the timing, but you can certainly control the content you provide and how you get it in front of the right audience. Utilizing a proper attribution model and having Goal Completions set up in Google Analytics will enable you to draw a straight line from the initial touchpoint (blog post via organic search query) to a micro conversion (eBook download) to a macro conversion (a sale). You’re going to want to start a newsletter mailing list for the purpose of – you guessed it – giving away more free content. Create a popup window on your blog – it will increase subscriptions by 300 to 500 percent. For Brafton, that number was 532 percent. Send a weekly newsletter with a curation of your previous week’s featured content. Again, staying top of mind, remaining relevant and avoiding overly salesy content at this stage of the funnel is key. If email subscribers are ready to buy, they will reach out in their time, not at a time of your choosing based on a quarterly KPI your boss is forcing you to hit. So you may have noticed we didn’t make macro conversions the be-all, end-all business goal for blog traffic. We said nothing about requests for demos, e-commerce transactions or any other revenue-generating activity being the only true measure of ROI or content performance. This was intentional; if you create a blog with this mentality, your blog will fail. The key is to fully appreciate the purpose of a blog and the nature of blog visitors. You can expect a blog to increase your search presence, and you can expect increasing amounts of tippy-top funnel visitors visiting your site, consuming content, then leaving. What you do with those visitors is completely in your hands at that point. Now things are going to get a little more comfortable from a commercial standpoint; we are going to start generating conversions, which are the metrics most marketers focus on. For clarity, we will be considering micro conversions as: eBook downloads, white paper downloads and case study downloads. For visitors who have arrived elsewhere on your site and decided to download an eBook, white paper or case study, the second they made the commitment to submit contact information they increased their intent and moved from the top of the funnel into the middle. Now it’s time to get them into the bottom-of-funnel. You are going to want to track the performance of your downloadable assets and core landing pages in very unique ways. Let’s start with downloadable assets. This will allow you to better understand time to ROI. 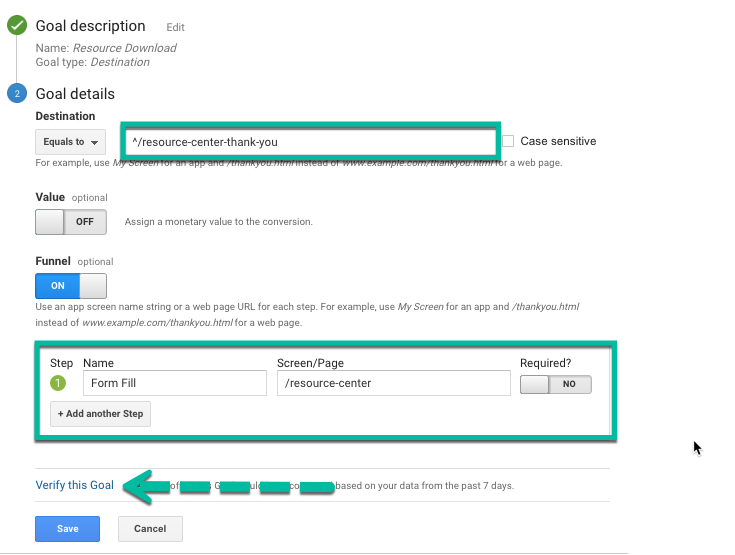 Downloadable assets need to be tied to goal completions in your analytics tool, either via destination URL or through an event. Implementing these goals will help you evaluate the total downloads of your asset, the channels in which people arrive on your site to download the asset and conversion rates for your form fill. You need to know all these things to make educated assumptions about the topic of your asset, the channels it was distributed on and the conversion rate of your landing page. For this demonstration, we will set up a destination URL for goal-tracking purposes. You set up destination URLs when visitors are directed to a “thank you” page after downloading a form. If there is no such page (the URL doesn’t change after downloading), you will need to set up an Event in the HTML. First you will go into the Admin Panel → Goals → New Goal. Create a new destination URL goal. Make sure the “thank you” page URL is unique from all other URLs on your site. Ensure the only way a visitor could reach this page is through the gated form fill. This page needs to be un-indexed so visitors cannot reach the page from Google. This requires everyone who reaches this page to submit contact information first. Add in the landing page URL where your form fill lives to determine your conversion rate. Test your goal before going live to ensure you have properly entered your URLs. Save your goal and start collecting data. A couple weeks after launch you should have sufficient data to start making educated assumptions. 1. Take a look at how many downloads you have had since launch. Go to Conversions → Goals → Overview. Hit the drop-down to select the eBook download goal you have set up. 2. Take a look at the quantity of downloads. Is this number what you expected? Do you have follow-up actions for the visitors who downloaded? You should be nurturing them with related content to keep your brand top of mind. 3. Take a look at your funnel visualization. We want to ensure the people who visit your conversion landing page are actually filling in the form. A low conversion rate indicates a low-quality landing page, or issues with your form. Set a benchmark of about 50 percent. We use Pardot to evaluate our asset conversion rates; this tells us the efficacy of our conversion landing pages. In our instance, you can see our keyword research guidebook was a weaker conversion landing page (it was an experiment) than the others. 4. Evaluate your top-performing channels. Navigate to Acquisition → All Traffic → Channels. Look to the far right of the screen and hit the goals drop-down and select your eBook goal. What are your top converting channels? What are your bottom converting channels? With this data you will know where you need to shore up your strategy. In this instance you can see our referral traffic drives the majority of downloads, and we need to do some work to gain organic visibility with our assets. Step one to accomplishing just that could be creating high-quality content that has a better chance of ranking in SERPs or optimizing existing assets to align with organic audience intent. 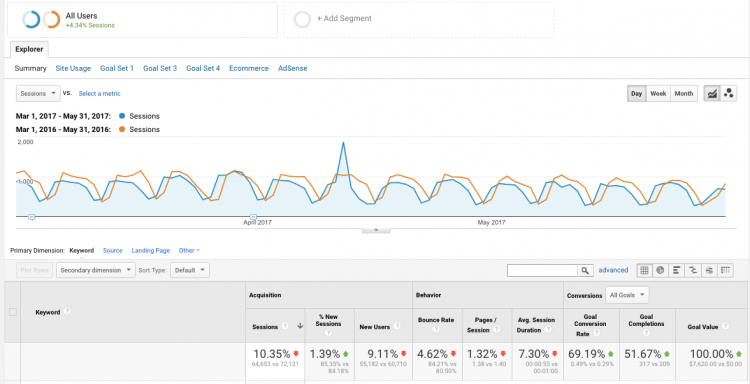 These actions should, of course, utilize your analytics data to inform your content investments and more strongly structure your approach to generating quality organic traffic. What is an asset download worth? Remember, nobody ever made any money by giving away free content. Asset downloads are worthless unless you diligently push your prospects to the bottom of the funnel. Ensure you have follow-up actions for each person that downloads your asset, whether it be a targeted drip campaign or a hyper-focused account-based marketing strategy. Additionally, your asset should be well-branded and contain clear contact information. These will likely be forwarded, printed, etc., and you should ensure whoever sees it knows who made it. Many people mistakenly consider asset downloads to be a bottom-of-funnel type of activity. These visitors are certainly engaged with your brand and have demonstrated a certain level of trust by giving you contact information, but they are likely still shopping, evaluating and consuming at this point. Until they have requested to speak with sales, they are not yet a qualified buyer. Now that you have completed 90 percent of the work (creating the asset, launching, getting downloads), you absolutely need to go the extra mile and nurture these visitors into taking the next step. Now we will get into a conversation that is a little more comfortable: macro conversions that directly tie to sales and revenue. We will consider macro conversions as requests to contact sales or for a product or services demo. This is the very bottom of your website’s sales funnel. Visitors who have landed on one of your core landing pages via a commercial-intent keyword have pre-qualified themselves as being mid-funnel right out of the gate. They have expressed intent with regard to your goods and services. It’s your job to usher them to the bottom of the funnel. Your product and service landing pages should be treated like the shelves in a brick-and-mortar store. They need to be clean, easy to navigate and highly accessible. You need to know where your shoppers are coming from, what they do when they are in your store, which aisles (landing pages) they are making purchases on, which aisles they aren’t, how often they are or aren’t making purchases and where they are getting stuck navigating. Now we can evaluate the top pages people land on prior to submitting contact information. Take a look at total conversions and conversion rate. Does anything stand out? We want to look at top-performing landing pages and underperforming pages. What are the top performers doing right? What are the underperforming pages doing wrong? Notice that Brafton.com is heavily reliant on the homepage to generate 67 percent of inbound leads. This disproportionate spread tells me our core product landing pages are not performing, or sometimes don’t exist. Navigate to those pages and experience them as if you were a first-time visitor. Use an objective and critical eye. Is the page user-friendly? Are there clear next steps, or is the page a dead end? Do you have strong calls to action? Is your form fill working properly? Is there anything at all that would prevent a visitor from submitting contact information? Ensure you compare product pages to each other. Which perform the best? Why do some perform better than others? Take note of any pages that drive significantly less traffic than others. Perhaps there is an issue with your search visibility and you need better keyword targeting for that particular keyword. Navigate to Acquisition → All Traffic → Channels. Which traffic sources are generating the most and least conversions, and why? In Brafton’s case, you can see that organic search is generating 55% of all macro conversions, followed by 21% from referral traffic. Now let’s take a look at trends to see if you are moving the arrow up and to the right. Navigate to Conversions → Goals → Overview. Are you seeing any trends with your conversions? Here we see that after a weak February our conversions more than doubled on a monthly basis and then remained stable over the next three months. Tip: Discuss with your sales team the close rate and average deal size for inbound web leads. You will want to quantify the value of each macro conversion. Understand that these metrics aren’t important for just marketers. Close rates and deal size are holistic business goals, and sales and marketing teams will need to work collaboratively to compile these metrics and, hopefully, improve them over time. The bottom of the funnel is an extremely nuanced place where every digital marketing discipline can make or break your goals. Seemingly small things like a glitchy form, slow page speed, poor CTA verbiage or low search visibility can significantly affect your conversion rates. This is why it is crucial to evaluate the numbers with a critical eye to ensure no money is being left on the table. There is always something more you can do to improve conversion rates. Take a look at your competitors’ sites and evaluate the ease or difficulty with which you can make a macro conversion. Are the CTAs clear and enticing? Do the pages load quickly? Are the forms overly long or just right? Every single aspect plays an important role. Take them all seriously. Content marketing is difficult to do right. It’s even more difficult when you aren’t sure what your goals are, or what constitutes actual ROI. Establishing a framework for measuring your results prior to creating content will result in a more robust strategy where each part of the conversion funnel is supported with content. By understanding visitors’ intent for every stage in their journies, you will be able to provide them with the right content at the right time to pull them through the funnel. And now you should have the tools in place for measuring the ROI from these efforts and iterations.